So it’s not the US Open or World Cup soccer finals. But it is the Superbowl of slalom, which heads to Prague, Czech Republic, Sept. 12-15 where the world’s best slalom paddlers will battle it out in the World Championships just months after the venue was deluged with a historic flood. More than 360 athletes are expected to compete in the event, set on the Vltava River, marking the second time the World Championships have been hosted in the Czech Republic (the first came in 2006. The event comes after the venue was flooded earlier in the year. While the talented Czech team will face fierce competitors in each of the five events, it is still expected to be among the favorites when the competition gets underway on Thursday. Who are the odds makers betting on? In the K1 Men, Peter Kauzer (SLO), the 2009 and 2011 World Champion, will face tough competition from Fabian Dörfler (GER) and the European Champion, Jiri Prskavec (CZE). Also in the mix are the Gold and Silver medalists from the London 2012 Olympic Games, Italy’s Daniele Molmenti (Gold) and Vavrinec Hradilek, the superstar of Czech paddling. As for the U.S., it’s admittedly a long shot to podium. “The Worlds after an Olympics is always interesting,” adds Jacobi, an Olympic gold medalist from the 1992 Games. “Some of the top performers from London are backing off a bit while others who just missed the Games are extremely motivated. Traditionally, such a Worlds favors some of the newcomers on the Slalom scene. Olympic Champion Emilie Fer (FRA) is the one to beat in the Women’s K1. At the recent ICF World Cup in Bratislava, the 30-year-old sensation outshone the rest of the field to win with a lightning quick run. Other contenders include the 19-year-old Silver medalist from the London 2012 Olympic Games, Jessica Fox (AUS); local legend and double Olympic Champion, Stepanka Hilgertova (CZE), Austria’s Corrina Kuhnle and the winner on the last occasion the World Championships were held in Prague, Jana Dukatova (SVK). Slovakia’s Hochschorner brothers, Pavol and Peter, will look to dispel gossip that their grip over the C2 Men’s discipline is loosening following their recent loss of the ICF World Cup series title, a title they had held for the previous 12 years. France’s Gauthier Klauss and Matthieu Peche now hold the series title and will hope they can translate their current form into a first World Championship Gold. Silver medalists from the London Olympic Games, David Florence and Richard Hounslow (GBR), will also be looking to add to medal haul. Local hope for Czech rests with the Beijing 2008 Olympic Silver medalists, Jaroslav Volf and Ondrej Stepanek (CZE). Stanislav Jezek (CZE) could well have the edge in the Men’s C1 event, that is, if he can maximize the local knowledge of his home course. 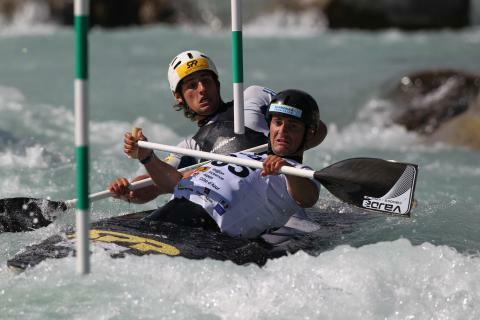 However, the return of Michal Martikan (SVK) and the swift moves of David Florence (GBR), Sideris Tasiadis and Jan Benzien (GER) will make life difficult for the veteran Czech paddler. Jessica Fox will be the favorite coming into the Women’s C1, as the young Australian looks to cap off an almost perfect season in the single blade event. Her strongest opponent is likely to be her compatriot, Rosalyn Lawrence (AUS). 2011 World Champion, Katerina Hoskova (CZE) and Caroline Loir (FRA) are also strong challengers. Founded by a team of industry veterans and reaching everyone from first-timers to seasoned pros, Paddling Life keeps its fingers on the sport's pulse through timely news coverage, event updates, profiles, gear reviews, video links, photo galleries, story links and more. Our goal: to support and grow paddlesports and keep the sport's stoke alive. Copyright © 2018 Paddling Life All rights reserved.